On November 23, 2018, AKA Black Friday, I was just sort of poodle-ing around FaceBook. You know, what I mean by poodle-ing, right? I was actively avoiding going anywhere near the malls by re-watching episodes of The Good Place for the 3rd time, and considering the wisdom of my pie to whipped cream ratio. So, there I sat, looking at pictures of food and family gatherings, thinking about gifts, getting addresses for holiday cards, watching TV, cuddling my judgmental dog, and catching up on FaceBook posts. I have semi-left/am trying to ween myself from FaceBook and failing miserably so I end up reading lots of stuff all at once. During my binge FB reading I saw long time children’s book champion, Teri Lesesne’s (AKA Professor Nana) October 10, 2018 public post about a new graphic novel by Jack Gantos. 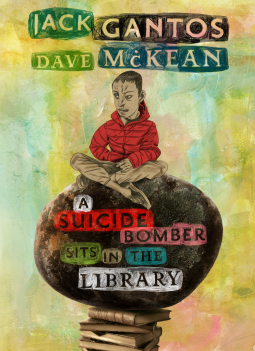 What caught my eye was the sheer incongruity between the title, A Suicide Bomber Sits in the Library, the cover image (provided), and the immediate praise for the book, “is a work of art.” I hoped I was misreading something – the dissonance was jarring. And then I read further … “art of language accompanied by art of illustration. Combined in one spare tale, it will leave readers stunned, off kilter, maybe even a bit dizzy as they turn the page, the page that also turns them. Jack Gantos and Dave McKean have created a story of hate and redemption. I found a few pages on the publisher’s website. I was struck by the abhorrent and racist representation of this unnamed, random “muslim”, young male protagonist. And, when I say unnamed I mean he is LITERALLY called “The suicide bomber” – like that’s his damn name. And, he’s supposed to be it a boy … and I use that term only because that is what the author claims … but he looks like a caricature of angry old man. The skin tones used in the book are pretty terrible – a sort of gray/tan/khaki color that is the same as the shirts and pants various characters wear. Stories matter. If you are reading this, chances are you believe that. And if you believe that stories matter, you have got to begin to recognize that when a boy gets no identity except male, muslim, and terrorist, that it matters. After receiving feedback from many in the #kidlit field, including an open letter from the Asian Author Alliance (read the letter here, and the followup here) Abrams pulled the book. I’m not going to thank Abrams because HOW DID THIS THING GET PUBLISHED in the first place? It is clear that the author, Jack Gantos, has no idea what the problem is as he continues to not listen to anyone but himself. Benjamin Doxtdator wrote a brilliant post about his experience of Gantos visiting his class here – Fact-Checking Jack Gantos. I think it is telling, and all too common, that Gatos has publicly reacted in surprise, defense, and frustration. Doxtdator writes, “Gantos said that he was “shouted down” by an “online mob”, and now that he has been told to “stay in his lane”, he would “retreat” to his “white boy dog house.” His words make it clear that either he not understand, does not recognize, or simply does not care that he has contributed to a frighteningly large pile of racist tropes that portrays Muslim males as nothing more than terrorists. Just then a boy’s cell phone went off. I turned and looked at him. He was wearing a red jacket. He was not holding a book. Instead, he reached into his pocked and pulled out a cell phone. He held it to his ear and did not speak. He nodded his head in agreement, then he stood up and quickly left the room through the doorway where overhead a paining of the Muse of Inspiration holds lightening bolts in his hands. One of these bolts struck me and I put my head down and wrote ‘A Suicide Bomber Sits in the Library’. So, there it is. A White, male, adult saw a kid, who he perceived was not White, take a call and walk out of the library. I have no doubt the scene took place exactly as Gantos remembers it. It is a scene I have witnessed innumerable times at that library. But, the inspiration was not the kid, or the painting. The inspiration was his own bigotry, fear, and xenophobia. Back on Facebook, I read Teri Lesesne’s public post, and the comments about the book pile up. Maybe not surprising, the comments were overwhelmingly positive and completely lacking in any critical pushback. The commenters were a children’s literature scholars, authors, teachers, and librarians. Two white guys write a book about a Middle-Eastern-ish suicide bomber CHILD?! in a non-descript Middle Eastern land?! in children’s book form?! masked as a lesson in reason and compassion?! I’m so dumbfounded by this. She linked the preview from the publisher which clearly shows it is being published with children in mind. Debbie Reese posted more from the publisher. Jillian Heise (@heisereads) posted the letter from Asian Author Alliance. 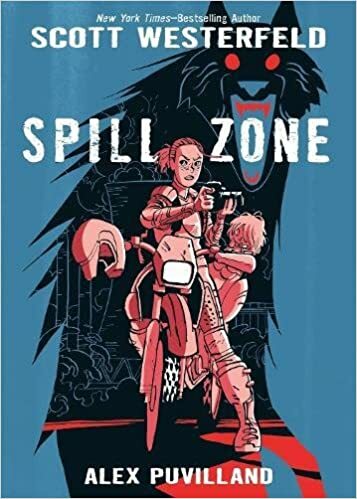 Melinda R. Cordell (@rosefiend ) and Melanie Hope Greenberg (I’m not sure if she is on Twitter) both voices concern for the effect on actual kids by this book. Then, in what I interpreted as a last ditch effort to save face for the author, Leslie Bermel (@Uryrwrds) asked, “You all do know the author is on this thread, right?” I asked how that changes the conversation and her response was “Doesn’t seem like a conversation anymore.” What surprised me was the “anymore“. Like, when it was accolades and flowers uncritically thrown at the feet of Jack Gantos, it was a conversation. But, when it changed to highlighting critical voices, then it was no longer a conversation. Why is that? Again, the publisher pulled the book. Which is good. But, this is going to happen again and again and again unless we, as a community, learn to recognize characters and stories that are based in long held privilege and strive to erase those depictions. That’s one of the problems – these depictions are familiar to those privileged gatekeepers – like the first responders to the FactBook post. The initial look at that cover, the title, and the story was familiar and so it felt true, and interesting and amazing to those readers who were predominantly White and all non-muslim. Publishing is a business. There is no reason for that business to change as long as participating in familiar ways is rewarded. And publishers are rewarded by book people – librarians, teachers. scholars, and researchers – buying and recommending books. That is the power of social media. There are more and more people becoming book people and letting publishers know we are here. We, those who are NOT represented by the imagined norm of White, straight, male, able, cis, middle class representation – are here. We are readers, we are teachers, we are librarians, we are scholars and we will continue to speak, even if when our voices shake. We will stand together and we will insist on a wider array of authentic representations from the literary world than the one we grew up with because we know stories matter. I use the term Booktoss as a way to communicate to the Literary Gatekeepers that we need to be willing to see the problems with books and toss some of them aside. There are a few consistencies in my life. Truisms about myself that I take for granted. I have always looked White and been Latinx. I’ve always been really strong and fat. I have been gay since before I knew what it meant to be a lesbian. I grew up expecting NOT to see my stories, but always in the lookout. I swooned when the Bionic man kissed the Bionic Woman – not because I wanted to BE him, but I sure as hell wanted to kiss her. Constantly searching for signs of LGBTQ life, characters, and yes, even romance was a constant. Discovering #ownstories published by small presses and sold out of lesbian bookstores that smelled of candles, hemp, and essential oil, sold non-ironic macramé, and specialized in the production of purple clothing was a rite of passage. It was rare to see any representation of LGBTQ folks existing in media and when we did make it to the page or the screen there were a few, consistent tropes: we were single and funny, a murderer, crazy and destined for some institution, or dead (sometimes combos). And, overwhelmingly White. So, yeah, I came of age when the bar for LGBTQ representation is pretty low. We are all products of a homophobic, racist, and misogynistic society so these tropes are hard to recognize and even harder to de-colonize from our minds. 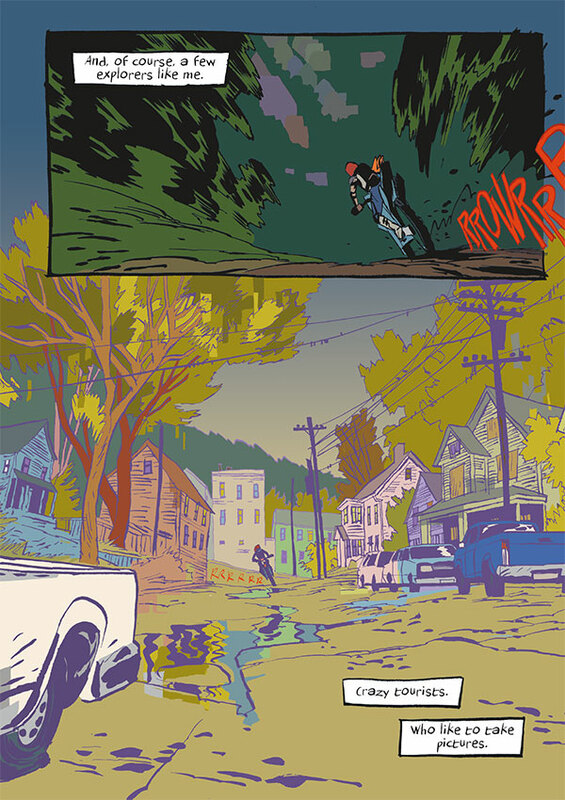 If you are looking for a graphic novel that breaks from these expected tropes don’t bother with Decelerate Blue. To be honest, it looks promising. The cover is a study of blues. There is what looks like a human heart in the center, with two young women facing each other, touching foreheads, in an embrace. The young women are flanked by much more violent images that make up a slightly recessed background and are colored in a darker blue. On the left, three people are holding long knives and looking determined, above their heads are hands grasping something between thumb and for-finger. On the other side, there are people in riot gear, attack dogs, and a young man getting arrested. For those who have read Jane Yolen’s Foiled! and Curses! Foiled, Again!! you might recognize Mike Cavallaro’s illustrations. Angela, the 15-year-old protagonist, looks similar to Aliera from Foiled. Angela lives in a future that values speed above all else. Movies last 15 minutes and are positively reviewed as hyper! Quick isn’t good enough, things have to be fastest! Literature is reduced to “brief lit”. This hyper existence is punctuated by short bursts of dialogue with each speaker signaling the end of an idea with “GO!”. This active and distracted life results in less time spent digesting what they consume – both mentally and physically. Heart rates are monitored, sleep is modified to keep everyone sped up, hyped up, and distracted. Angela is a rebel and, as rebels often do, she finds herself in a literal underground community that values slowing down and is attempting to disrupt the hyper-commercialism, speed driven society. They practice meditation, eat farm to table, and crave a slower pace. Angela finds Gladys and romance blooms – in three days they are ready to declare their love, spend all their time together, and plan art projects. Seems pretty on par with most lesbian relationships. At some point things get creepy – and not in a good way. The underground rebels decide to take an experimental drug – Decelerate Blue – that quickens the slowing of their physiology – including their heart rate. Get it? They can’t wait to slow down, so they have to take a drug to make the process of slowing down go faster. When the three leaders tell the entire community to take this drug – which no one has ever heard of – they all comply. The followers are willing to take a drug, en mass, because their leaders tell them to. This was too much like the People Temple mass suicide/murder overseen by Jim Jones in 1978. The image of a bunch of young people ingesting a drug on the say-so of their leaders is only one of the serious issues I have with this graphic novel. Just after feeding each other the pill and laying down to wait for the effects to take hold the underground compound is attacked by security forces in riot gear wielding batons and dogs. The attack is vicious, and to no lesbian’s surprise, Angela and Gladys are separated. Angela sees Gladys taken down by a dog, her hand outstretched, her eyes fading. Angela is saved, the underground caves are filled in with ultra-quick drying cement thus sealing the fate of the entire community. After that, Angela is told her parents have arranged for her to be institutionalized to help her get over her behavior. She escapes, heads back to the entrance of the underground compound, and overdoses on the remaining Decelerate Blue. We, as adults, need to demand better from the books that represent mis- and under-represented communities. We need to insist on more substance than this tired collection of damaging tropes. Lesbians deserve to live. Period. We deserve books that show our lives are worthy and worthwhile. This is not that book. There are plenty of people telling me I am too harsh on children’s books. I’m too quick to call out the overwhelming Whiteness of authors, illustrators, editors, and critics. I get pushback for directing criticism to our children’s literature organizations, literacy associations, critics and bloggers. There are times when someone takes me to task and I wonder – have I gone too far? Am I part of the PC internet-Twitter-mob? (Is that even a thing?) Am I looking for racism, sexism, ablism, and homophobia where it isn’t? Then I look to other critics who are, by in large, NOT straight, White, able or male and I see the same reactions, the echoes, the same plea for respect. Recently Edi Campbell tweeted out a book cover and asked a small number of critics (including me) if we saw “the problem”. I’ll admit I didn’t see what the issue was at first. I barely looked at the girl, noticed the book was written by Lemony Snicket (AKA Daniel Handler) and thought …. “What am I not seeing here? God, is there another watermelon joke?” I trusted my colleagues and I knew that if I wasn’t seeing the problem it did not mean there was not a problem. It meant I was not seeing the problem. And, the answers were awful. First, Sarah HANNAH Gomez (@shgmclicious) tweeted out the book cover, accompanied by the racist image of a golliwog. Although usually found in the UK, the golliwog is yet another blackface image we could do without. Then, Allie Jane Bruce provided another kind of image. There it was. The awful truths. That “mood” was a call-back to a racist visual trope aimed right at Black and African American kids who would see it and feel it, even if I did not Once I saw it I could not unsee it. Read Edi Campbell’s blog post about the book here CrazyQuilts blog. We have to decide, as a community of book lovers … do picturebooks matter? Do they help kids see the world? Do they help kids build themselves? If reading and books matter than we have to come to the realization that images within books matter, too. We cannot believe that books are important but that representation isn’t. We, as a community of educators, cannot have it both ways. It matters that this book confirms the age old visual trope of black = bad, and curly = unruly and must be tamed! (see the stick). If picturebooks matter than the messages contained within the words and images matter even if we, as adults, do not initially see those messages. After emailing and tweeting the author and the publisher for a few days, there was a response – an actual apology. Not a “sorry YOU took offense” but an actual “oops” and promise to do better. Books matter. Those of us who’s identity was built in part by the books we read know this to be true. Books save lives, they open doors, they allow us to escape into worlds and possibilities beyond what we see. But, the flip side of this is that books can damage and degrade readers who see themselves represented as the problem, the issue to be solved, the condition to be cured. That is what many critics, book bloggers, and awards committees do not want to admit. The lists and honors matter to teachers and parents because they rely on experts. But, who is the expert on non-White, non-heterosexual, disabled representations? Again, I did not see the problem even when it was, literally, staring me in the face. The Eisner award nominations came out about a week ago and Raina Telgemeier’s Ghosts was on the list. 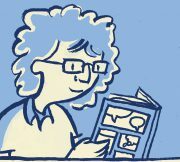 She appropriated Latinx culture, and completely erased Native American history in her graphic novel (link to my critique, link to Debbie Reese’s critique). I’m not surprised but I am disappointed by the nomination. White authors using culture and identities as cheap plot devices and lazy tropes – including books like Telgemeier’s Ghosts – isn’t new. The overwhelming, overrepresentation of White, straight, able males in children’s books isn’t new. What is new is our voices on social media. We will not be silenced by a call for niceness. Instead, we will raise our voices to be heard above the din of fragility. We echo each other. We seek out allies who recognize the beauty of diversity, and the strength of hearing stories in told in #ownvoices, like Gene Yang’s Reading Without Walls Challenge. If all your book lists, including that stack of books you have ready for summer reading, feature people who look and sound like you, make an effort to read beyond yourself. Start with 2017 We’re The People book list. Read blogs like Latinxs in Kidlit, The Brown Bookshelf, Disability in Kid Lit, CrazyQuilt, The Dark Fantastic, and American Indians in Children’s Literature. It is Martin Luther King Jr. day here in America. I wanted to draw attention to work other than March on this MLK day. So, I want to highlight and call attention to the graphic novel adaptation of Kindred by Octavia E. Butler. If you’ve never read Butler’s work, you have missed out on some mind bending sci fi work. I’m not a big fan of the genre but I have read the Lilith lyapo series (Dawn, Imago, Lilith’s Brood, and Adulthood Rites) series. Butler is not a great Black sci fi author. She is a great author who writes sci fi and is Black. What’s the difference you might ask? Isn’t that just semantics? And I would answer, NO! Her storytelling is tightly constructed, her characters are whole people I had a hard time letting go, and they are diverse. The characters are good and bad – often at the same time – Black, White and alien (with tentacles and everything!). She deftly crafts settings that are unknown and familiar. But, for all this love I must confess I never read Kindred. It didn’t sound interesting … I am not a historical novel kind of gal and when I saw the book was about a contemporary (it was written in the 80s) Black woman being summoned through time to to save a White boy in the Antebellum south, I was out. Not interested in the least. Hard pass. But, now Damian Duffy and John Jennings have written a graphic novel adaptation … so, I had to read it. I downloaded a review copy while ago, before Christmas at least, but put off reading it. I continued to be not interested. Turns out, I’m an idiot. From the first page with the startling image of a Black woman in a hospital bed and the first line of text, “I lost my arm on my last trip home” I was hooked. This book captured my attention and held on for dear life. I have read it several times, and still think about it. There is something artfully painful about the struggle, both historical, and fantastical that this graphic novel captures. Set in the summer of 1976, Dana, a contemporary Black woman, married to a White man, living the life of a struggling writer is wrenched out of her time deposited in the Antebellum south. She arrives just in time to save a young White boy, Rufus, from drowning. But, there is no explanation of how or why she transported through time and space. And, perhaps more importantly, no clear way for her to get back. I was less intrigued than I was scared crapless by the set up. Did I mention Dana is BLACK, and not some high-yellow Black with straight hair and light eyes that could pass. Nope. Dana is dark skinned with a tight afro, large lips, and broad nose. There is no hiding her Blackness and I think that is an especially important aspect to this adaptation. The protagonists, the heroine, is a woman who is illustrated to be unmistakably and unabashedly Black. Dana discovers that she can and does return to her life when she is in a life threatening situation. Right after she saves the boy, some unseen person draws a gun on her and aims it at her head. She returns to her home, to the shock of her husband who saw her blink out of existence and then reappear a few seconds later, wet and muddy and in a panic. The second time Dana lands on the plantation, she has more time to discover what is going in, but honestly, it still doesn’t make sense! Instead, I was worried about her getting caught and killed or worse. I mean … HELLO!! Black Woman on a freaking PLANTATION!!! As the book continues, Dana keeps going back and forth and each time she is in more and more danger. Each time the violence she must endure is worse. As she gets more accustomed to the level of violence and pure hatred she experiences as a Black woman on the plantation, the violence required to return her to 1976 increases as well. In other words, the more time she spends surrounded by systematic, socially accepted, violent racism the more inured she becomes. The novel is challenging to read. The illustrators are brutal in their depiction of the violence against Black bodies. It also passes the Bechdel Test many times over. I’m glad I took the time to read outside my comfort zone. You should, too. *I will never add his name into the social media sphere because it feeds the beast.